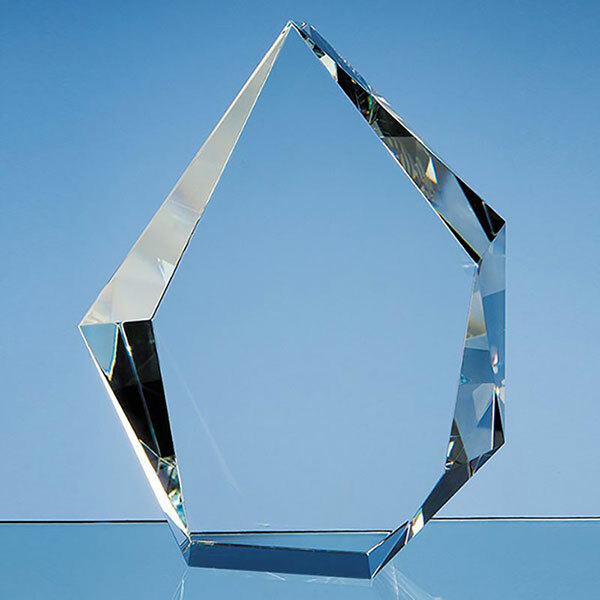 Optical crystal iceberg award SY2077, a fine quality 20cm tall optical crystal award in striking asymetric 'iceberg' design. Perfect for engraving as corporate gifts or awards, and offered with engraving and/or colour print options. These distinctive awards are hand made from flawless optical crystal, 60mm thick and with an asymetric 'iceberg' design. Reassuringly weighty, they are free-standing and the flat front of the awards is ideal for engraving. These 20cm tall awards are offered here with engraving and/or colour print options, allowing you to create striking and customised corporate awards, recognition awards or achievement awards. Each crystal iceberg award is supplied with an attractive black foam-lined presentation box.